Welsh expatriates missing the sweet smell of home can now buy a bottle of air from the hills of Wales - for £24. 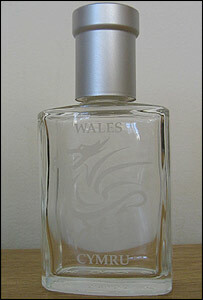 Businessman John Gronow will launch walesinabottle.com on Thursday to sell Welsh atmosphere around the world. If anyone wonders whether it is the real thing, each bottle comes with a certificate guaranteeing the air has been gathered in the Welsh mountains. The idea is backed by Prime Cymru, a business agency for over-50s whose president is the Prince of Wales. 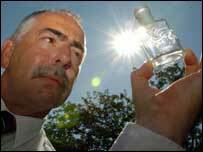 Mr Gronow, aged 58, from Lakeside, Cardiff, has collected air from Snowdonia and the Brecon Beacons. Other manufacturers may look enviously at how cheaply he obtains his raw material. But while the air may be free, Mr Gronow has had to travel to collect it, as well as invest in the specially-made bottles, packaging and certificates. He said: "I am offering a genuine service for people who want something of Wales that reminds them of their childhood or their homeland. "It is the genuine article from the green, green grass of home. "There are more Welsh exiles out there around the world than there are in Wales who long for something from the land of their fathers." He has received support and advice from Prime Cymru, which was formed in 2001 after the Prince of Wales suggested a support agency was needed for entrepreneurs aged over 50. Prime Cymru adviser Ken Pryce said he had been sceptical when he first heard about the idea. "I looked around for the cameras," he said. "I thought I was being set up. "It was so outrageous that I thought maybe it was a joke, but in fact the more I got into it the more I realised it could be very big." The cynical may question whether the air is actually from Welsh hills, and Mr Pryce said: "I'm a businessman and I said, 'Why go all that way? Why not bottle it in Port Talbot?' - although you would have a different colour then. "But he wasn't having any of that. He's got lots of stock already." Mr Gronow said: "We want people to treasure these bottles."